We are over halfway through session! Keep up with the bills FAN is supporting by viewing our Bill Tracker, which we update a few times each week. Last Tuesday was Jewish Community Lobby Day. 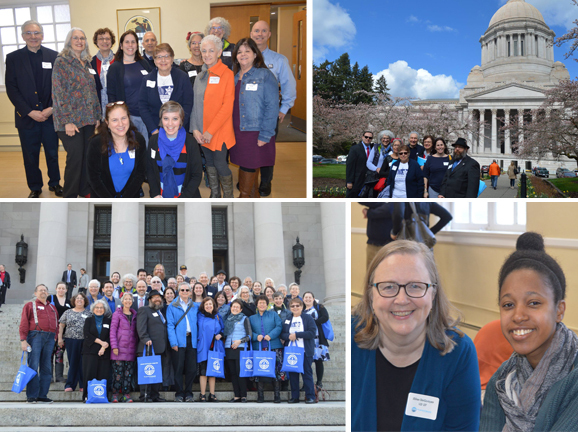 FAN Staff Elise and Amber (bottom right) joined advocates in Olympia, including a great turnout from Congregation Beth Shalom (top left)! Thanks to Jewish Federation of Greater Seattle for the use of these photos. Monday: The Three Strikes Reform (SB 5288), the Death Penalty Repeal (SB 5339), and the Department of Corrections (DOC) housing vouchers (SB 5441) bills were all heard in the House Public Safety Committee. Tuesday: FAN Staff Elise and Amber attended Jewish Community Lobby Day with many of our partners. We advocated for TANF, hate crimes legislation, religious accommodations in higher education, and Holocaust education in schools. Wednesday: FAN's Religious Zoning Bill (HB 1377) was heard in the Senate Housing Stability & Affordability Committee. SB 5356, establishing a state LGBTQ+ commission, was heard in the House State Government Committee with a lot of opposition organized by the Family Policy Institute, directed by former state Senator Mark Miloscia. Thursday: The H-2A Farmworker bill (SB 5438) was heard in the House Labor & Workplace Standards Committee where FAN Co-Director Paul testified. Paul and I-1000 sponsor Nat Jackson met with the chair of the House Members of Color Caucus Rep. Valdez. The Religious Accommodations for Postsecondary Students bill (SB 5166) was voted out of the House College & Workforce Development Committee after several amendments were defeated. The Sustainable Agriculture bill (SB 5947) was heard in the House Rural Development, Agriculture & Natural Resources Committee. Friday: The House debated and approved HB 1109, the biennial operating budget for 2019-2021. The Senate also released their proposed budget. Monday: Paul attended three policy partner meetings: Anti-Hunger and Nutrition Coalition, Keep Washington Working Coalition, and Washington Anti-Poverty Advocates. Four bills from our Legislative Agenda moved forward: Religious Zoning (HB 1377) out of Housing Stability & Affordability to Rules; Three Strikes Reform (SB 5288), Death Penalty Repeal (SB 5339), and DOC Housing Vouchers (SB 5441) out of Public Safety to Rules. The Senate Ways & Means Committee had a public hearing, and several elementary-aged kids testified with a parent on cuts to local school staff. Tuesday: The Opportunity for All Coalition, which FAN is part of, met and reviewed several human service and revenue/budget bills. Governor Inslee met with African American faith leaders about I-1000 to reinstate affirmative action. The H-2A Farmworker bill (SB 5428) was voted on and passed in the House Labor & Workplace Standards Committee. The Food Waste bill (HB 1114) was voted on in the Senate Agriculture, Water, Natural Resources & Parks Committee. Wednesday: The Sales Tax Bonding bill (SB 1406) and the Missing & Murdered Indigenous Women bill (SB 1713) will both be heard in Senate Ways & Means. Thursday: The Senate Transportation Committee will hear the very important Clean Fuel Standards bill (HB 1110). Friday: The Senate will debate and approve its operating budget bill. The budget is a moral document that should especially serve the poor and vulnerable in our communities. Even with the increased revenue coming into the State Treasury, many human service programs will need funding because of cuts made during the Great Recession. In these final weeks of the legislative session, we will be prioritizing budget items to make sure important programs are funded. Budget: Capital Gains and Progressive REET These two important budget items will help us balance our upside-down tax code. Both were included in House and Senate budget proposals, so if your legislators are on fiscal committees (Senate Ways & Means or House Appropriations), thank them for including these in the proposed budgets. Follow the link to send a message to your Legislators to include these proposals in the final budget, with some of that revenue going toward the Working Families Tax Credit which will help the lowest income-earners save more of their paychecks via a tax refund (the lowest income-earners pay almost 18% of their earnings in taxes, while the highest pay 3%). Affordable Housing Sales Tax Bond Bill (HB 1406) This bill allows counties to reserve a small portion of sales tax collected to use for affordable housing. This would not raise sales taxes but allow counties the option to use part of it for housing purposes. This bill will have a hearing on April 3 and will be voted on soon. Follow the link to send a message to your Senator to prioritize this important bill, particularly if they are on the Senate Ways & Means Committee. 1-800-562-6000 between 8 AM and 7 PM, Monday through Friday. To find out who your legislators are, click here. Click here to use this week's Take Action pdf in your faith community or organization. Once every 10 years, the Constitution requires that there be a full count of the population residing in this country. We are only one year away from the 2020 census, which will begin in Spring of next year. An accurate census count will bring important economic and political benefits to our communities and state. More than $800 Billion in federal funding, as well as proportional voting representation and political power are at stake. Federal programs like SNAP, WIC, and Medicaid are vital to community health, and states receive federal dollars to administer these programs based on census results. People of color, children, renters, folks experiencing homelessness, people with disabilities, and rural communities have long been undercounted in the census. Communities more likely to be undercounted are often already facing barriers to health like poverty and unstable housing. Without enough funding for census outreach, these communities are even more likely to not be counted in the 2020 census. That means that those who could benefit the most will see even less funding for critical services that contribute to the well-being of families and communities. Faith communities have an important role to play! Though we are a year out from the census count, it’s good to start preparation and educational outreach for this momentous occasion. Check out this factsheet to learn more about the importance of an accurate count. Keep an eye on FAN's Facebook and Twitter pages, as well as the hashtag #CountMeIn on both platforms to follow along with and share social media actions. FAN has stood against multiple iterations of the Muslim Ban put forth by the Trump administration. The Supreme Court has ruled this version valid, so now Congress has the power to change it. The NO BAN Act will be introduced in the House and Senate next week to not only repeal this hateful policy but to create new standards to stop discriminatory bans in the future. FAN has signed on to a national letter of support. You can sign on in support of the NO BAN Act as an individual by using this form. Responses must be submitted by April 9. Please share this link broadly with your networks! 2020 Census jobs are available! See the King County flier, or visit the website to find more information about opportunities in your county. Hope in the Color Purple: Rev. Jean Kim's Autobiography - available now! Rev. Kim's book is on sale now, and all proceeds will benefit programs that work to end poverty and homelessness. Rev. Kim is available to host signing events - see her flyer for more information. Meet Your Muslim Neighbors: Ramadan and Values in Islam April 6, 2-3:30 PM Redmond Library, 15990 NE 85th St, Redmond. Hosted by Muslim Community Neighborhood Association. Supporting Student-Centered Movements: A Community Conversation April 6, 4-5:30 PM Spokane Health Sciences Bldg, Rm 110Z, 310 N Riverpoint Blvd #160, Spokane. Co-sponsored by the Poor People's Campaign's Truth & Poverty Tour. Find other events and opportunities on our web calendar. Please send your events for posting to fan@fanwa.org. We especially welcome your events outside the Puget Sound area! Help FAN the Flames for justice year-round; support FAN with a donation! You are receiving this email because you have taken action using our online tools or signed up for our mailing list. Keep Faith Action Network out of your spam filter. Add fan@fanwa.org to your safe sender list.